Sardar Patel University is a university in Gujarat state of India. It is named after Shree Sardar Vallabhai Patel (October 31, 1875 - December 15, 1950). It was founded in 1955 by Shree Bhailalbhai D. Patel, known as Bhaikaka, and located in the new town of Vallabh Vidhyanagar in Anand District. The University has many affiliated colleges as listed below. Originally the university had the status of a rural University but now the university has diversified with the moto of "Excellence Matters". The university has been accredited with the four star status by the National Assessment and Accreditation Council. Sardar Patel University, Vallabh Vidyanagar has 51 affiliated Colleges. Click here to explore them. 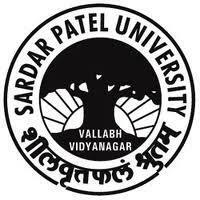 Sardar Patel University, Vallabh Vidyanagar has 13 Departments listed that offer various academic courses. Are you Interested in studying at Sardar Patel University, Vallabh Vidyanagar?